The first thing we did was to consult the arbiters on-site, directly. It wasn't a matter of suggesting foul play, but to know whether it might not be some software issues, that took into account the presence of female players or any other specific group, biasing the pairings in some remote way. I can confirm we are using Swiss Manager version 12.0.0.171 (21 June 2017) and Swiss Master version 5.6 (build 12). These programmes do not use the same pairing programme. Our procedures are that I input results and make pairings with Swiss Manager, Deputy Chief Arbiter IA Arno Eliens does this in Swiss Master independently. Then we compare full pairings of both programmes and only if these are exactly the same do we publish the pairings. Gender is a field in players' data — as it is in FIDE data. However, it is not used in the pairing algorithm for computer pairings. We do not use the manual pairings option (except for the first round to insert the random pairings made). For further specifics of the software used, we would like to refer you to the programmers. Indeed, in the interest of due diligence, we did consult the programmers, asking them to look at the pairings, and tell us with certainty whether they were the result of pure, unfettered software pairings, with no outside input. Heinz Herzog is the author of Swiss Manager, the most widely used, and progenitor of Chess-Results. I checked the first 6 rounds of the Masters Open. I can confirm, that the pairings was done without manual intervention. These findings have been passed on to Yifan, who was forced to wonder what bizarre twist of fate had made her victim to such an incredible series of coincidences. Nevertheless, she was reassured, as were we all, that everything was in order. Having received a half point in her 5th round bye, Hou Yifan is paired in round six against GM Panchanathan Magesh Chandran...a man! After six rounds, Magnus is clear of the field on 5.5/6. Today Carlsen played his third "creative" opening as Black, this time 1...b6, then slowly took over the initiative and the point. "I try to do some things that I might not allow myself to do in other events," Carlsen told Chess.com. 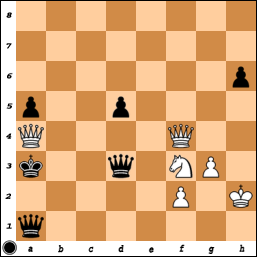 In his other two games as Black, he's used the Tiger Modern and the Nimzowitsch Defense. Carlsen is 3-0 in his Black games. That's half as impressive as his career record against Eljanov. Carlsen moved to six wins in as many games against the Ukrainian. He guessed that part of the reason he scored today as Black was that Eljanov never settles as White, no matter who he is playing. "He's usually quite ambitious with the white pieces," Carlsen said. "He doesn't play for a draw and maybe that's why I have such a big record against him." I can confirm we are using Swiss Manager version 12.0.0.171 (21 June 2017)"
I paired with a latest version (though don't remember numbers, but assume it should be dated August), and got the same pairings for R4. There was a "manual" input as several players took byes, and most significant for Hou (1.5) it was Kostenkiuk's (2 points) bye. Though, I was not checking what if Kosteniuk played that round. - It’s rare that Carlsen doesn’t win a tournament or take 2nd place. - Karpov won the most impressive number of tournaments in the history (more than 160) Never, other chess player will obtain the same results !! - Kasparov won or tied for first in all tournaments (15) he played in between 1981 and 1990. Both Vidit and Carlsen had the black pieces in the last round. Carlsen gets the white ones because in such pairings the higher ranked player gets the white. How would this work if they both had white the last round? “All players have the option of one half point bye in rounds 1 to 8. I've played pretty much non-stop for the last 2 or 3 months - the South Wales International, the Dundee GM all-play-all, the Midlands Open, The British Championship, 41 games of various time controls in Qatar, Paignton Premier and now the Isle of Man. That's probably far more than any other GM on the planet during the same period. Ontario weather has turned cold after an unusual period with temperatures 10C degrees above the seasonal average. Today, on the Isle of Man, there are scattered showers, 16 C and winds of 31 km/h. - Perhaps that explains his Benko Gambit today? The two leaders have drawn and Santosh Vidit is in with Simon Williams explaining the game. It seemed that things weren’t exactly going Magnus’s way and he was happy to exchange off and draw. On the other top board, Gawain Jones is having a rough time of it versus Fabiano Caruana. One supposes that this is the old “eating chocolate” ploy. Fabiano thinks he has a winning position and then is rocked to his very boots by Gawain nonchalantly eating chocolate. The game continues with Gawain getting a cup of tea. Hikaru looks on. If Gawain eventually comes back with a 20-pound roast turkey then, if I were Fabiano, I would resign myself. Ah, no danger of that. Gawain offers his hand to Fabiano and the game is over. Then Gawain takes his tea and walks off with Fabiano to analyze the game. - Nice nice nice. A game to play over. The 20-year-old Wagner plays Nakamura today. - So how is Hikaru in the standings? Jan Timman comes in to sit with Fiona and discuss the ending of his game with Peter Leko. In one possibility each side had two passers and a draw. Jan says that it is an interesting experience to play in an open tournament where more than half of your opponents are grandmasters. He is here with his wife and they are enjoying themselves. Fiona says that today it was announced that the English Chess Federation has awarded Jan its Book of the Year award for Timman’s Titans. He says that for half a year he worked 6 hours a day on the book. The total work was one and a half years. Fiona asks who was his favorite player. Timman says that Kasparov was the greatest World Champion. The Short List this year contains four differing and wide-ranging books reflecting the different personalities of the writers. Two long standing world class players reveal their opinions; Portisch on the Ruy Lopez and Timman on world champions Euwe to Kasparov, while Smirin has produced a joyous book on the complexities of the Kings Indian. Aagaard meanwhile considers how decisions can/should be made at the board. A rich collection with something for every reader whatever their interests. The cover of this book shows Smirin’s intentions: King’s Indian Defence, but the word “Defence” is crossed out with big red slashes and replaced by “Warfare!”. Not a conventional opening book then, but an exhilarating collection of games, illustrating the tactical and attacking aspects of the defence. But what lifts the book above the ordinary is Smirin’s lifelong love for and the enthusiasm with which he plays and writes about, the King’s Indian. When a player as renowned as Portisch, (8 times a world candidates qualifier) who was famed for his meticulous opening preparation, writes his first book in English (as far as the judges are aware) on the Ruy Lopez, it is eagerly anticipated and does not disappoint. Portisch defended the Ruy throughout his playing days and examines, on an evolutionary basis, the Ruy’s major variations and systems. Essential reading for a Ruy practitioner; but Portisch also includes perceptive comments on the chess world and players he encountered during his long career, which greatly adds to the books value. Timman has for many years combined outstanding playing and writing skills. In this very personal book he looks at the personalities of world champions from Euwe to Kasparov. He met them all except Alekhine and played against most of them many times. He knew/knows them personally. This gives him a unique insight into their characters and chess styles. Timman includes games and positions he played against the world champions. In doing so, he gained a remarkable insight into a group of widely differing men who only had in common a wonderful chess talent. - Long live the Benko! Shirov, Alexei – Visakh, N.R. Eljanov and Vidit and just had two whites in a row. Nakamura? Caruana? Sutovsky? Last edited by Wayne Komer; Friday, 29th September, 2017, 09:24 PM. The pairings priority is always about giving the player their due colour. Not to give them white. 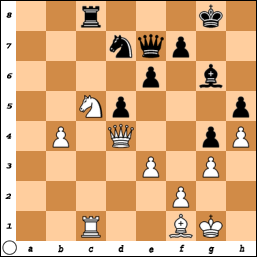 In this case, both Carlsen and Vidit were due white. Carlsen having more points in the tournament, gets his colour. If they were both due black, Carlsen would have gotten black. Caruana-Carlsen is the game of the day. 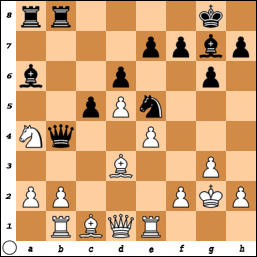 In Nakamura-Sutovsky, Emil has sacrificed two pawns for a non-attack and is losing. Simon Williams is ecstatic about Akobian-Lenderman because White pushed Harry the h-pawn and it is ready to queen. He compares it to a Morphy game and says that analyzing the variations that were never played was the best ten minutes of his life! It is an agreed draw. Varuzhan says in the post-mortem that the h-pawn move was played by Kasparov in his recent St. Louis game and had only been played twice before. Nakamura and Sutovsky are discussing the game that Hikaru just won. This sets up a Nakamura-Carlsen final tomorrow! Hikaru was surprised that Emil didn’t play his usual Grunfeld and employed the Queen’s Gambit Accepted. Emil tried to be very enterprising but missed Hikaru’s strong reply. It looks like tomorrow Magnus plays Hikaru with Hikaru being black. The final round starts an hour and a half earlier. Aman Hambleton is playing Julio Granda Zuniga (2653) with seconds on his clock to move 40. Eric, his second, is behind him looking on. Simon says that he is feeling very nervous for Aman because the end is near. Granda Zuniga is a self-taught grandmaster from Peru (b. 1967). Supposedly, he has never opened a chess book but is a great natural talent. Olimpiu Urcan - By demonstrating the risks associated with Caruana's 15.g4 novelty, Carlsen offered a strategic masterclass today. In his postgame interview Carlsen said he thought there were lines for Black that were extremely complicated after g4. It is good to beat someone after walking into his prep. Caruana had a 38-minute think at one point. Magnus played very carefully in the ending so he wouldn’t screw things up. He has an extra half point when meeting Hikaru Nakamura in the final tomorrow for the title and first prize. What does David play to win the game? Last edited by Wayne Komer; Saturday, 30th September, 2017, 02:13 PM. All set for the showdown of Magnus vs Hikaru in the last round for first place! Lots of interesting moments in this tournament. Personally interested in the games of James Tarjan and how he manages to work positions. A very interesting final round with Carlsen-Nakamura, Anand against Hou Yifan, Jones vs Kramnik, Akobian vs Caruana, Adams vs Xiong, Hambleton vs Kavutskiy and, even the hooded Lawrence Trent vs Leon. The premier game is between Carlsen and Nakamura and ends quickly in a draw. At the post-mortem, Naka said that he should have beat Lenderman as White and then played against Magnus in Round 7. Overall, he is happy with his result. He is going to Boston tomorrow for a Forbes Conference, then there is some Red Bull stuff in Texas, then playing Fabiano in the chess.com speed match in November, a match against Topalov in St. Louis and then the FIDE Grand Prix in Majorca and finishing up with the London Chess Classic. Magnus won the tournament. Carlsen thought that Naka might play the King’s Indian but instead had a chance to play something solid. In Naka’s place he wouldn’t have pushed very hard. What has been bothering him this year is that he hasn’t playing very well but he is encouraged by his recent results. He thinks that is because he has been very relaxed – except for these last two rounds. His girlfriend was there with him and so he was “forced” to get away from chess for some time each day. He is playing in the chess.com speed match. He is going to Singapore as well and nothing else until the London Classic. 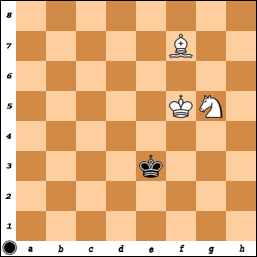 Can you mate a tricky grandmaster with B and N in 26 moves or less?